So we all know that I bang on constantly about not all waxes (paraffin, soy, palm and beeswax) being equal… well, that applies to beeswaxes too. 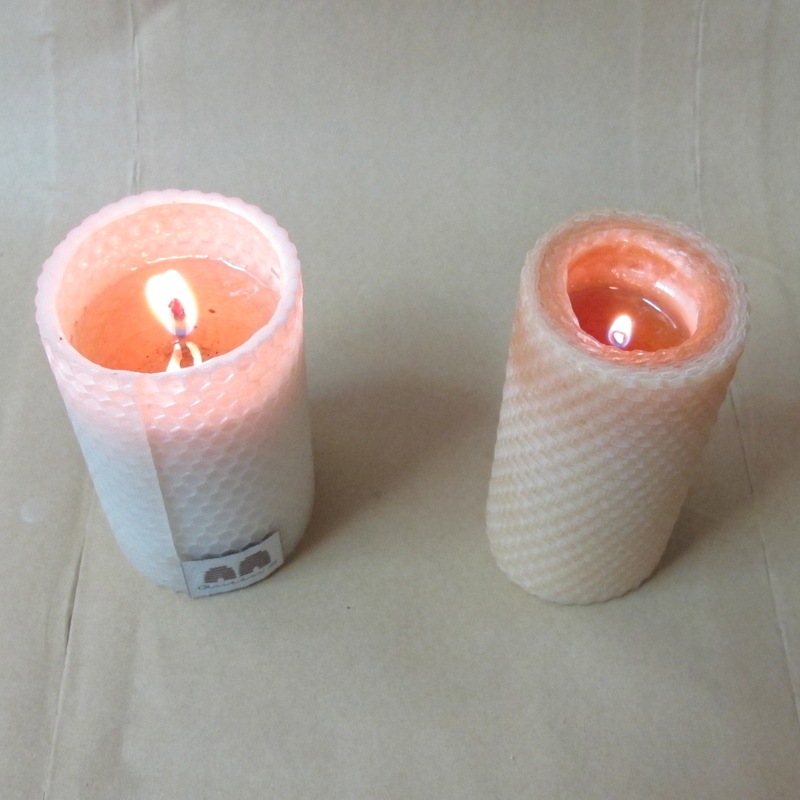 A few weeks ago a customer bought a ‘pure beeswax candle’ for me from Dusk. 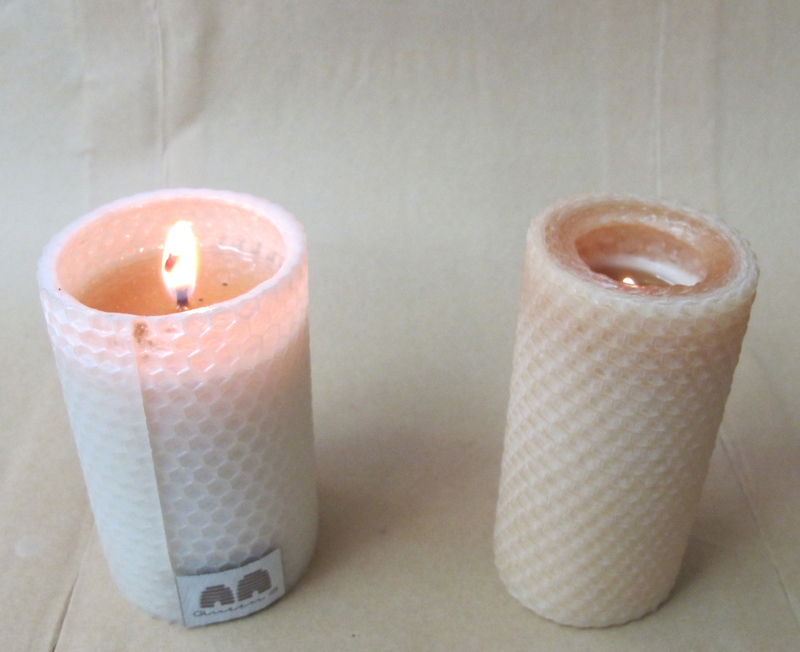 It is sold at a discount to a the smallest Queen B hand-rolled honeycomb candle (theirs is about 20% narrower and would have less labour as it is not finished properly). A part of me was thrilled that this purveyor of paraffin (petrochemical wax) candles now had a natural beeswax candle as part of their range, but I was a little disappointed to see that they were using what appeared to me to be very dirty beeswax, using the wrong wick and that the candles were messily made and unfinished. Aesthetics first (because that is how you get a customer to notice your product in the first place): by not finishing the candle top and bottom it doesn’t actually sit straight and, in addition, most house proud people don’t want candles that look dirty. And now on to the performance – which is really driven by the wax and the wick. When bees make beeswax it is white, so any colour in beeswax is impurities. 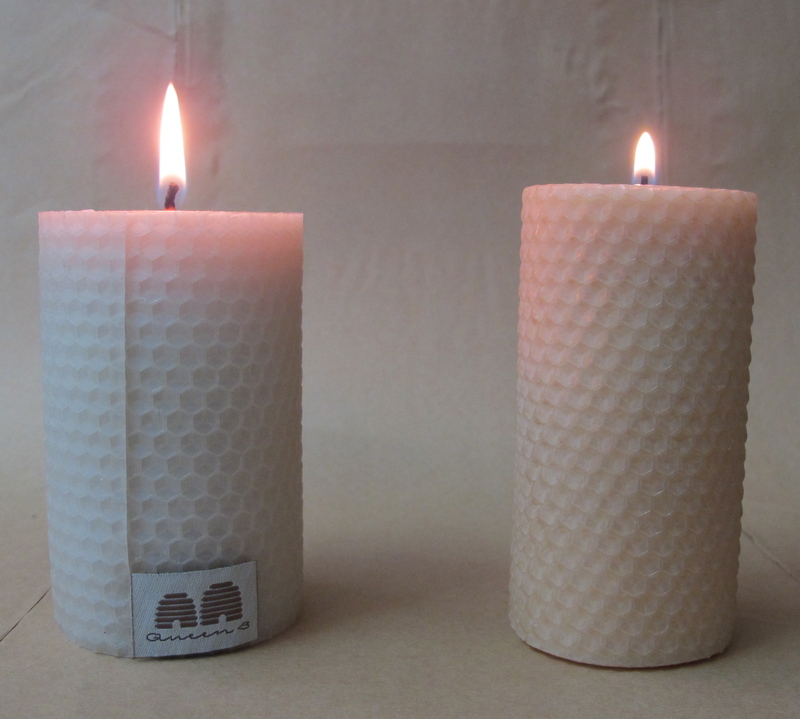 A little of that is great… a little honey residue is what gives beeswax candles their natural honey aroma. 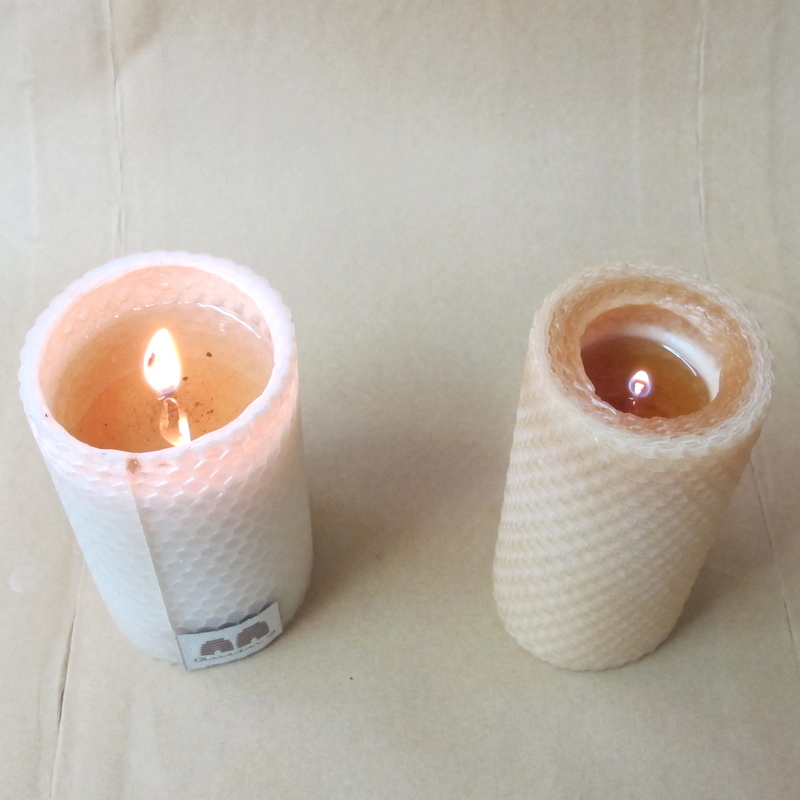 But a lot of impurities are a disaster waiting to happen in terms of a candle doing what a candle is supposed to do… ie provide light with a lovely, large flame. It’s one thing to have a theory (and a decade of pounding your head against a brick wall to learn what you’ve learned :-0) and quite another to see that play out. So we fired them up. Notice the respective sizes of the flame upon being lit (and that the Dusk candle doesn’t sit straight). 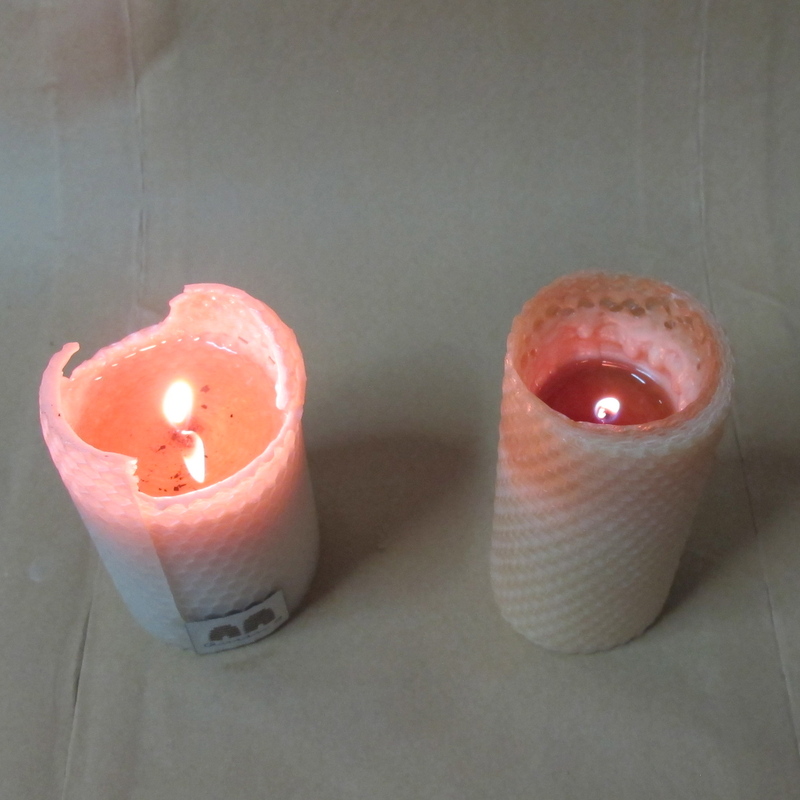 After 30 minutes… wick used in the Dusk beeswax candle is beginning to drown… (the clean beeswax and cotton wick in the Queen B candle are performing well… happy queen). An hour and a half in, the difference is even more noticeable. If I were the Dusk customer I would now be thinking that beeswax candles are cr*p and don’t burn properly. I’d be very disappointed. I’d be thinking twice and thrice before forking out my hard earned money on beeswax candles again. Three hours… You really have to wonder how rigorous their testing procedures are… or do they just not care? And after seven and a half hours I’d seen everything that I needed to see. Anyone who knows me knows that anything that I say, I will say to someone’s face. Brutally honest? Yes. Two faced? No. Three days ago, armed with my tests and photographs I called Dusk to try to speak to their product development people or the relevant buyer. I was told by the Help Desk that they couldn’t give me those details for “privacy reasons” and to rather send an email. 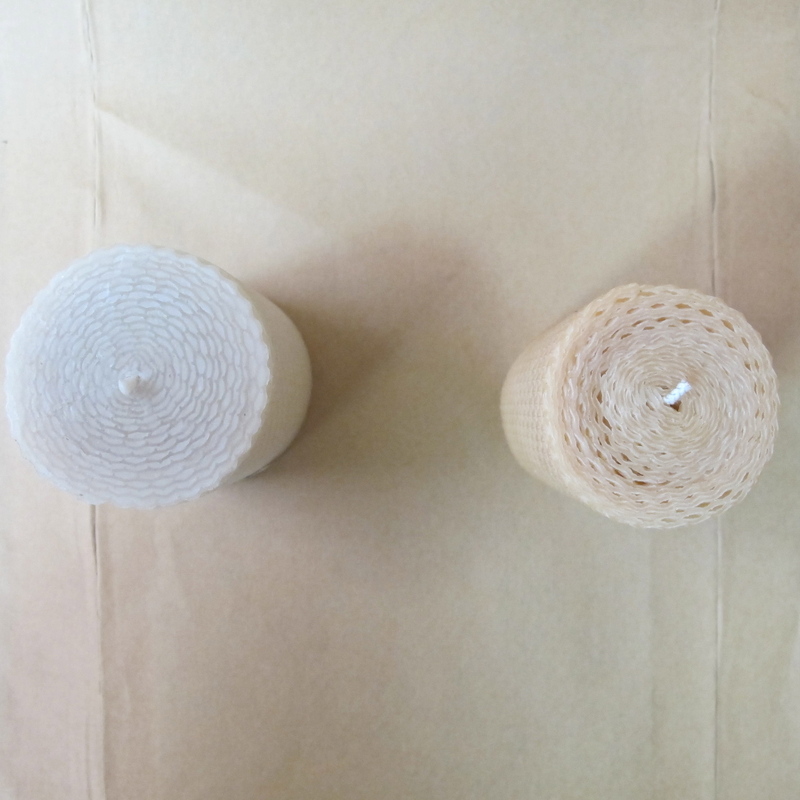 I sent an email the same day – firstly alerting them to the problem (selling a product that didn’t perform, destroying their own brand and damaging the reputation of beeswax candles) and secondly offering to make their beeswax candles for them. “Don’t just give me problems, give me solutions”! I received a response telling me that my email had been sent on “to the appropriate persons who will be in touch should they wish to discuss further”. The “appropriate persons” haven’t been in touch yet. 2. we only buy beeswax from specific honey flows, from specific beekeepers and we have searched far and wide over the past decade to find those beekeepers who are producing the best beeswax available… and we pay well above the market rate so that they earn a premium for the premium product that they sell. 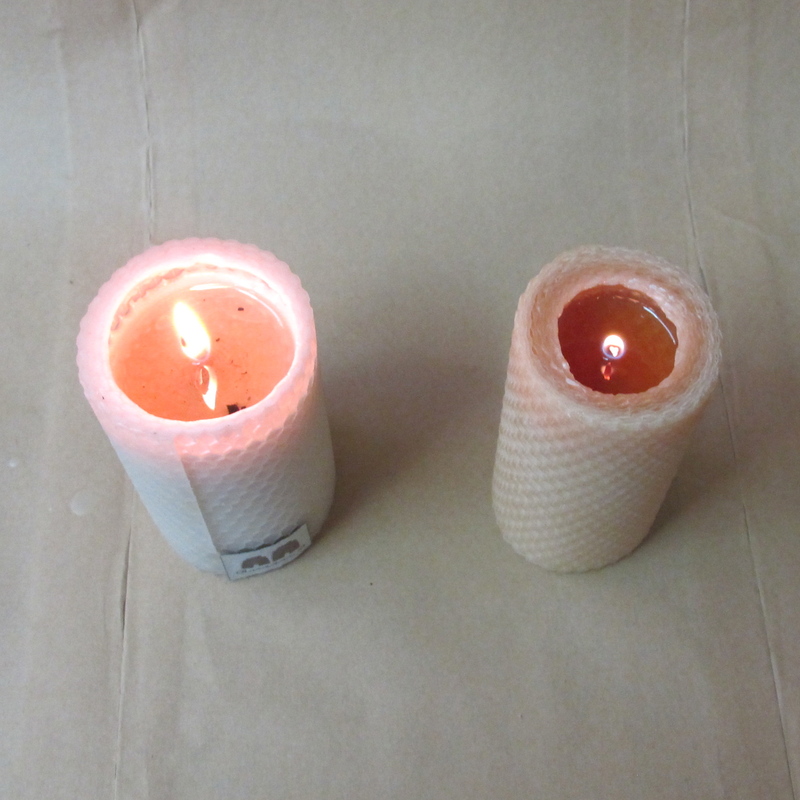 4. we spend literally months on wick testing before we launch a candle on to the market. With literally hundreds of pure cotton wicks at our fingertips there is a lot of testing to be done. The difference between the wrong wick and the right wick is often only evident several hours into burning… or in certain weather conditions… or on a particular surface. It’s not a craft, it’s a science. 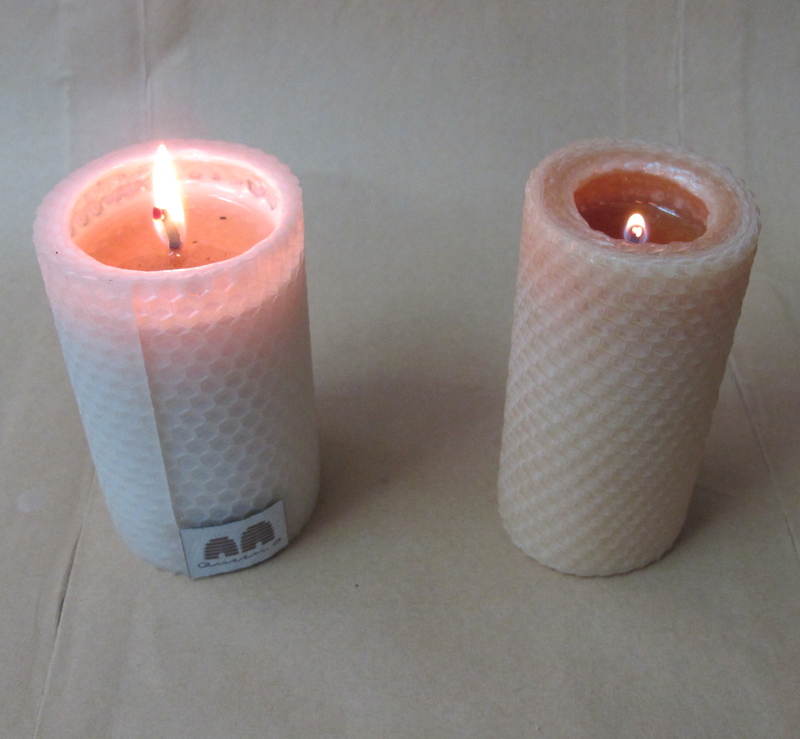 5. we hand make every Queen B candle. Sure you can churn them out of a machine faster (and cheaper) but you forgo quality and you forgo the ‘je ne sais quoi’ that makes a hand made product special. Not sure how hippy you want to be about these things but I can be a bit out there and to me there is a certain magic in a candle that has been made by a person. Sure it costs a little more. Many a well intentioned person has advised me to look at mechanising our process or moving production off shore. But to me it is untenable. We have focused on being outrageously efficient and every single person who has ever worked at Queen B has understood very early on that if we aren’t all efficient we are out of business. 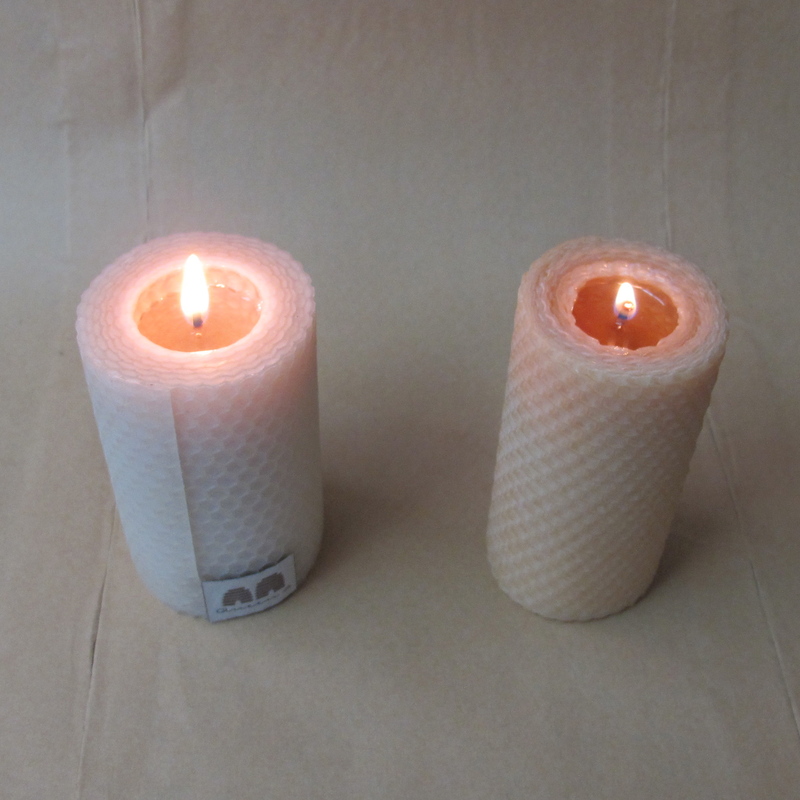 Designing and hand-making pure beeswax candles is a craft. Ensuring they burn properly is a science. 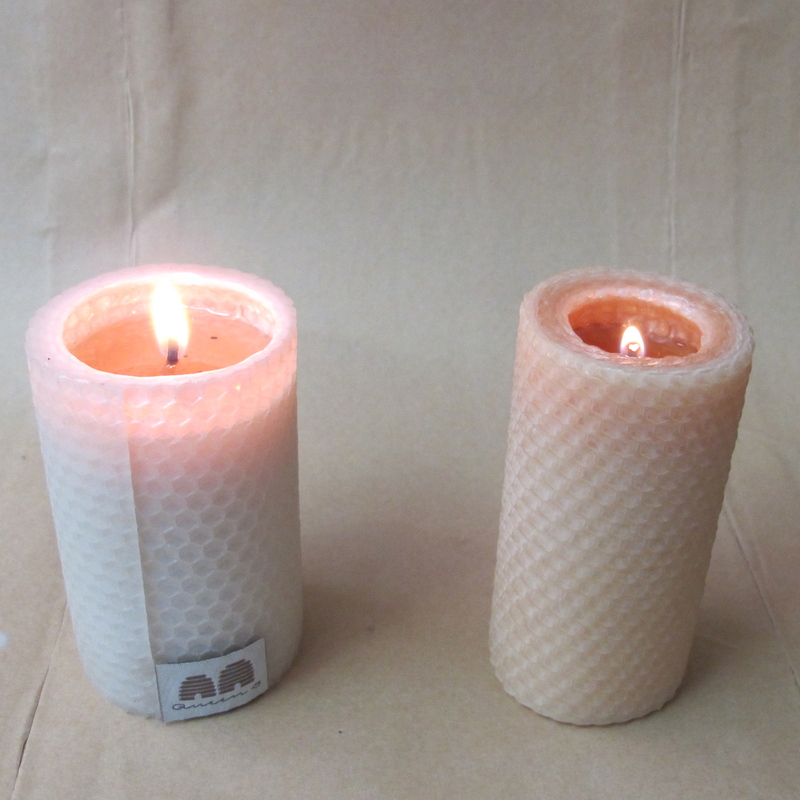 At Queen B we try to do both with excellence, and THAT is the difference between a Queen B pure Australian beeswax candle and any other beeswax candle on the market. Being a complete perfectionist has many, many drawbacks and one very obvious benefit. The drawbacks are primarily mine to deal with, the single benefit is the greatest gift that I can give our customers and the bees that make the beautiful wax that goes into Queen B candles. Thanks to you for your support. Ultimately it doesn’t matter how good our wax is, how comprehensive our wick testing is or how much perfectionism we bring to the job, if no one is prepared to buy your wares you don’t have a business. Thank you for letting me run this business. I consider it a great privilege to do what I am passionate about every single day. Keep up the great work Cate, we LURVE your candles and I for one don’t mind paying extra to have a superior product.